James McAvoy is set to reignite his relationship with Jamie Lloyd’s Trafalgar Transformed. 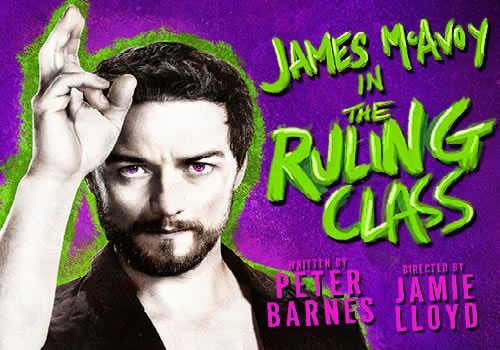 Following sell out success in Macbeth in 2013, McAvoy returns to the Trafalgar Studios, this time in the role of Jack in Peter Barnes’ award winning satire, The Ruling Class. The Ruling Class is a dark comedy that focuses on the quirks of the 14th Century English Nobility. McAvoy’s character Jack inherits the title of “Earl of Gurney” after his father’s bizarre yet tragic death. Despite being a paranoid schizophrenic who regularly breaks into song and insists on sleeping on a cross, Jack makes some attempt to go about his life as the Earl. In order to try and cure Jack of his unfortunate messiah complex, his scheming family give him electric shock therapy, which somewhat backfires when Jack then begins to believe he is Jack the Ripper…It is safe to say that chaos ensues. Directed by Jamie Lloyd, The Ruling Class will feature designs from Soutra Gilmour. Whilst The Ruling Class is a satirical comic play, it does contain adult themes and is therefore not suitable for young children. Children over the age of 12 who are accompanied by an adult may enjoy the show.